Participants discussed policies and incentives to increase the flow of investment across West Africa. West Africa is stepping up efforts to integrate regional economies and improve the investment climate with the support of the World Bank Group. At a mid-June event in Dakar, a regional public-private dialogue framework was launched to jointly identify regional and national investment constraints, facilitate investment-policy improvements, and enhance integration in the region. Preliminary national investment policy reform agendas were developed for each country that are part of the Economic Community of West African States (ECOWAS). 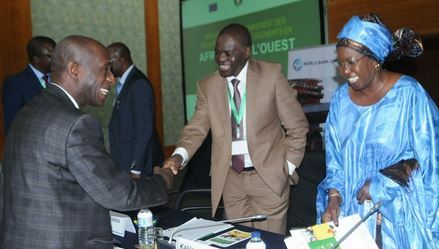 More than 50 representatives participated in the two-day event from the public and private sectors of the 15 ECOWAS countries, including ministers from Senegal, Niger and Liberia. The member countries strongly welcomed the initiative. It was hosted by ECOWAS and the West African Economic and Monetary Union. Reforms target investment entry regulations and investment incentives, to help reduce uncertainty for investors, enable governments to attract more and better-quality investments to their countries, and increase the flow of investment across the region. The improvements will be monitored through scorecards and offer opportunities for member countries to discuss best practices.